Edvance360, LLC, winner of the 2011 and 2015 CODiE Award for Best Post-Secondary Course or Learning Management System, has announced its release of Edvance360 LMS-SN Version 8.0 (for release notes, go to http://www.edvance360.com/release_notes_80.php). 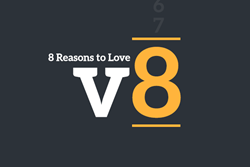 Eight all new reasons to love Version 8, from Edvance360, a consistent leader in online education. Reason 8: Revamped Calendar – Take scheduling to a whole new level. Reason 7: Wiki 2.0 – More options, more power, more robust. Reason 6: Offline Reporting & Other Reports – No one else has Offline Reports and you need it. Reason 5: Granular User Access Controls – Yep, down to the nitty gritty. Reason 4: Dashboards, Dashboards, and More Dashboards! – Reports are passé. Reason 3: In-Browser Document Reading & Markup – Making grading papers MUCH easier. Reason 2: Course-Building Wizard – Answer a few questions, drop in your files, and Presto! Reason 1: Completely New Interface! – And it’s responsive, gorgeous, and custom. Unparalleled Personal Support – Edvance360 is a demonstrated leader in its commitment to personalized support for its clients. Affordable Pricing – Edvance360 pricing is significantly lower than other commercial vendors. Pricing is regularly 30%-50% below competitor prices. Forward-Thinking Commitment – Edvance360 was the first to combine social networking and other Web 2.0, collaborative tools (Wikis, Communities, Journals, Blogs, RSS feeds, etc.) with the Learner Management System. Open Standards and Specifications – Edvance360 supports SCORM and Common Cartridge. Edvance360 is an Internet-based Learner Management System (LMS) and secure social network that enables institutions to implement a successful online program. Edvance360 equips schools, corporations, and organizations to host online courses, implement modular courses, and revitalize traditional courses. Edvance360 is headquartered in Virginia Beach, Virginia, with operations in South Carolina and Georgia. For more information, please visit http://www.edvance360.com or call 866-458-0360.